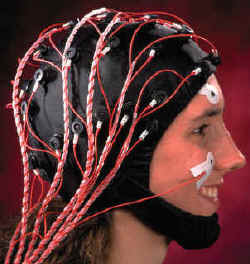 The Quik-Cap is a cap with integrated electrodes. The electrodes are kept in place by rubber holders that are much more comfortable for the patient then alternative systems. Also the chin-strap is comfortable because it runs over the tip of the chin and NOT under the chin. Each electrode position is cleary marked. The material of the cap is very flexible. This means that with one size you can cover a large range of headcircumferences. The electrodes are either Tin, Gold, Ag/AgCl or Sintered. The wires are attached along the outside of te cap and are then bundeled into a connector. The number of electrodes can vary from 19 to 256. 990000xx Quik-Insert electrode for Quik-Cap. Consists of electrode, holder with 3" connecting wire, a crimp socket with epoxy raisin and ring. No soldering needed. Use a hot-air gun.